Weber EP-310 Genesis Grill, one of Oprah's favorite things! Directly from "What's Hot This Summer" by Oprah! 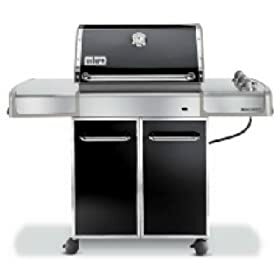 Oprah says: "With three stainless steel burners, a built-in thermometer and a handy warming rack, the grill's features are top-of-the-line. "The best part is that this classic grill now comes in new colors, like my personal favorite," Oprah says. "I love this copper." The grill is also available in black, green and dark blue." - Includes 10' Flexible Hose, Limited Warranty, Weber Cookbook Included.